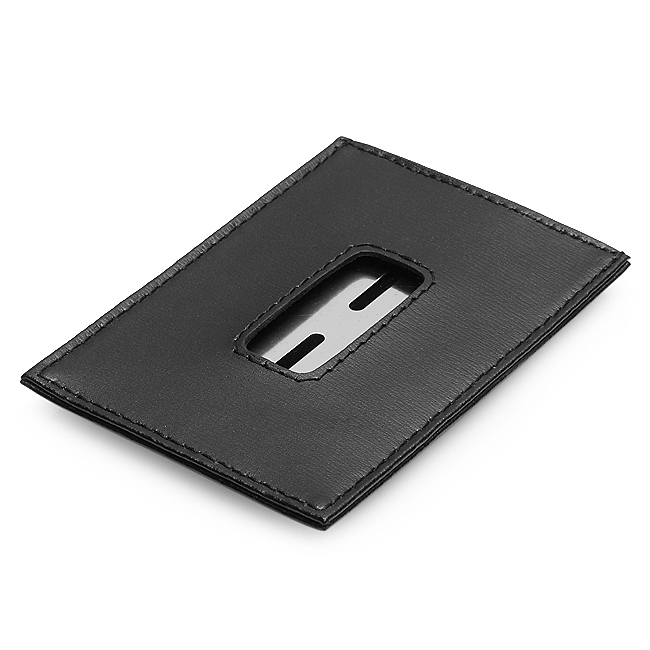 Sleek and compact, the black leather and steel money clip is the welcome alternative to the bulky wallet. 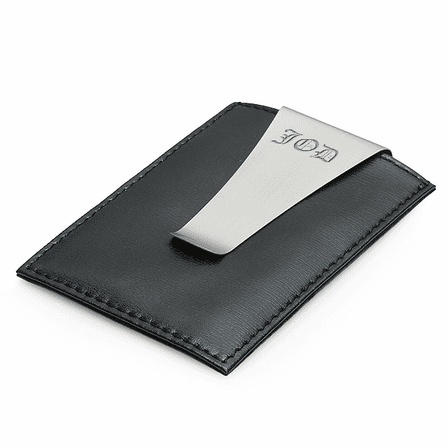 Now you can carry up to 3 credit cards in the center slot of the leather wallet, and up to 15 folded bills in the simple French fold money clip. It's easy to add and remove cash when you are ready to pay the bill, giving you a classy charm that is sure to be noticed! We will personalize the clip with your name or initials at no extra charge, and will send it within one business day in a jewelry gift box. Dimensions: 3 7/8" x 2 5/8"
I am wanting this engraved but I had something more specific in mind. It is an L with a diamond around it. Could y'all do that? Sorry, we would not be able to engrave that. For the engraving, would it be possible to include an infinity sign, such as ∞ ? Yes, just let us know in the comments section of our checkout page that you would like an Infinity sign. Also, let us know if you would like it engraved above or below any text you're having engraved. We don't carry just the leather part separately, sorry. They come as a set. 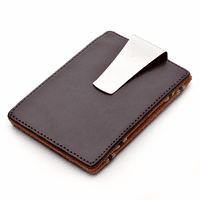 If you purchased from us, we'd be happy to send a replacement of the entire wallet & money clip out for you. 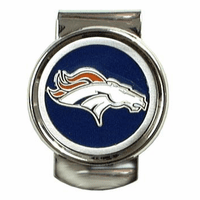 Just email us at help@executivegiftshoppe.com with your order # and we'll ship it right out. Medicare insurance card does not fit in his money clip card holder. I am looking for one a little larger then most clips. What are the dimensions of your clips? They all vary but you can see the dimensions for all of them in the bullet list under the features tab. Do you keep your money clips, credit card holder, and wallets in stock? How quickly would it ship? Yes we do. 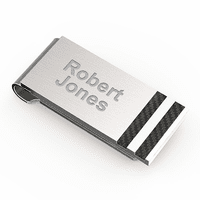 All of our wallets, money clips, etc ship the next business day after you order them, even with engraving or personalization. Exactly as described. My husband loved it!! Great little money clip, and credit card holder. I was tired of carrying around a wallet full of useless items. This helped me streamline. Now I only carry my drivers license, two credit cards, and cash. Excellent for those looking to get rid of a bulky wallet. purchased this in 2006. 5 years later, its time for another. It held cards and licenese great, tight at first... but holds 5 easily. keeps cash tight, who cares about the monogram... I loved this clip! Exactly what I was looking for. Very fast delivery and a great price! Worked great as groomsman gits. Arrived quick. This was a gift, a money holder which was requestwed by the recipient. He was tired of carrying a bulky wallet but wanted more than just a money clip. He wanted a place to store charge cards and ID. THis fit the bill, perfectly. It came promptly and he LOVES it. Hopefully this holds more than 1-2 cards. It seems like a pretty "tight fit." Maybe it needs to be broken in? The monogramming is very very light and can hardly be seen.